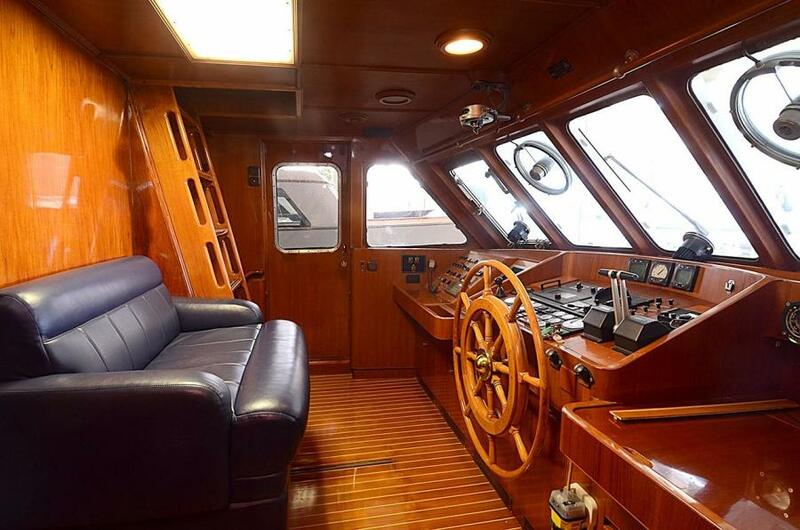 United Yacht Sales New Jersey would love to guide you through a personal showing of this 85' Jongert Long Range Cruiser 1986. 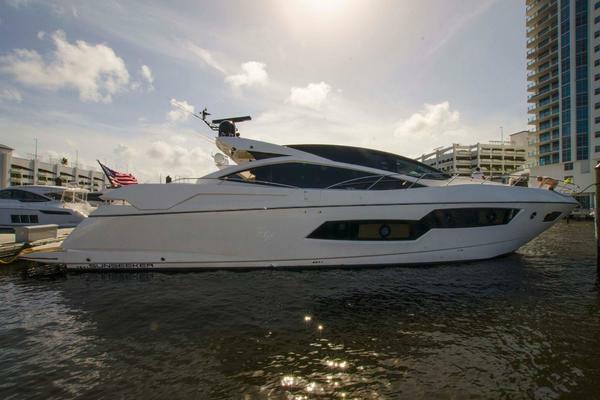 This yacht for sale is located in Fort Lauderdale, Florida and priced at $899,000. For a showing please contact us by filling out the form on this page and we will get back to you shortly! 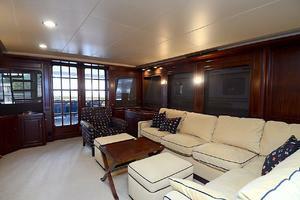 Entering HALCYON DAYS through the aft French doors, you will find yourself in an elegant salon that gives a stunning impression as she is fabricated with warm sapele woodwork. 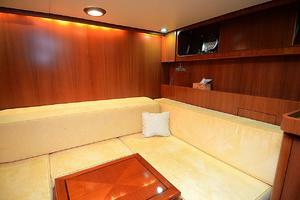 On the port side of the salon, there is an L-shaped couch for comfortable lounging. 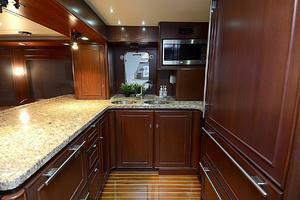 To starboard, disguised by the cabinetry below, there is a Plasma TV with an entertainment center. 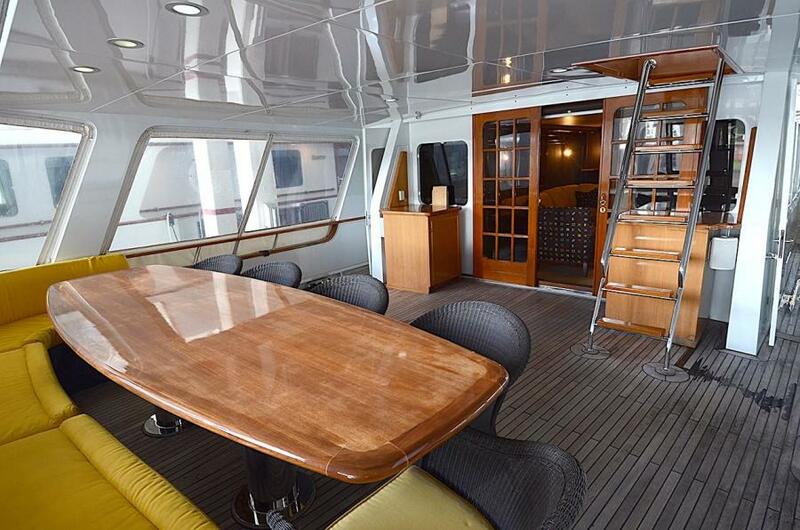 The windows on both sides of the salon may be lowered for you to enjoy a nice, natural sea breeze.As you enter via the aft French doors, you will notice a curved staircase to the port side. 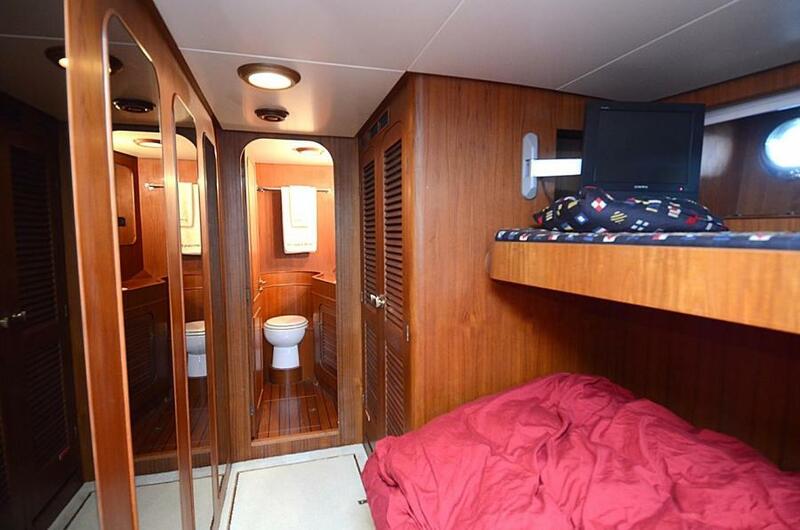 This will take you down to the delightful full-beam master stateroom. Flowing along the staircase structure, and through the master, is the same rich sapele paneling as the salon. This master stateroom features a king berth and three hanging closets with ample cupboard and drawer storage. 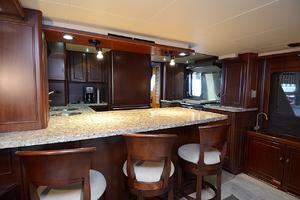 There is a TV with a DVD player mounted on the wall to starboard. 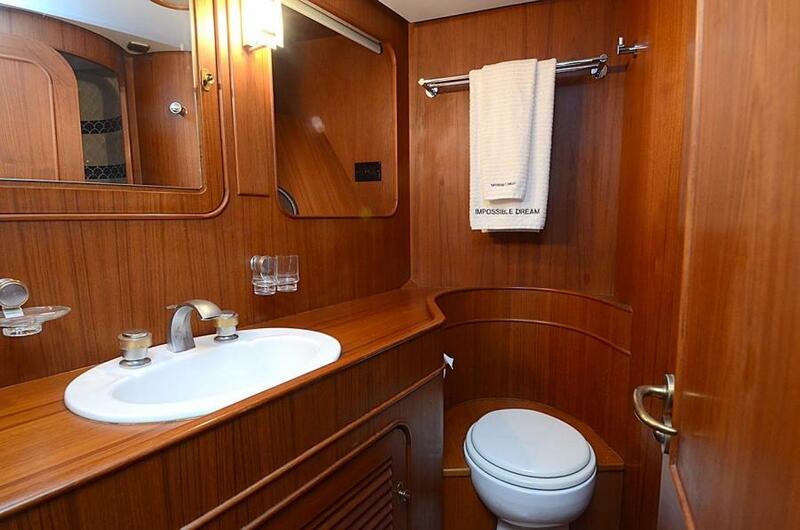 To port, there is a lady's vanity with a stool. Adjoining the berth's night table is a two-seat settee. 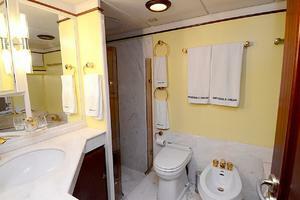 The marble-lined master bath includes a Jacuzzi tub and toilet, bidet, shower, and sink. 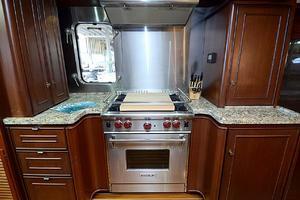 All fittings have gold finishes. At the end of the master stateroom's companionway, you may access the engine room.Forward of the salon, and to starboard, you will notice the mahogany inlaid bar as it is equipped with a sink and includes plenty of storage for glassware, wine, etc.Fore of the inlaid bar, you will be approaching the buffet bar and well-furnished galley.Forward of the galley is the pilothouse where the remaining staterooms are accessible. To port and forward is the guest stateroom that features twin berths and a pullman. 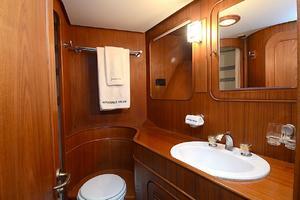 Also, this stateroom is equipped with drawer storage and a hanging closet. 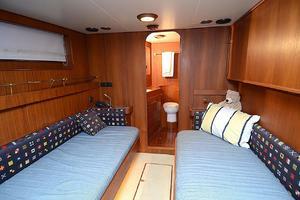 Outboard, you will see a built-in TV/DVD and sound system. 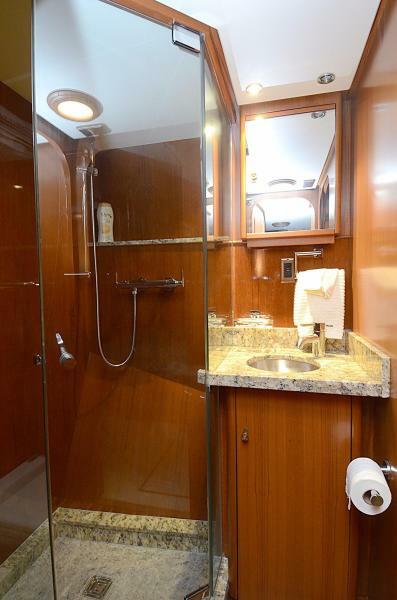 The guest bath is located forward with a tiled, circular shower, toilet, and sink.To starboard is a second guest stateroom with a double berth and upper single berth. 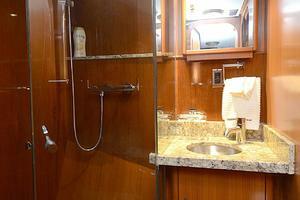 This stateroom also has drawer storage and a hanging closet. 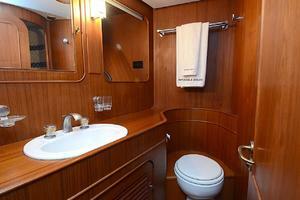 The ensuite bath is similar to that on the opposite to port. 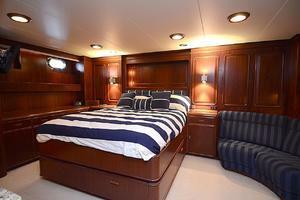 The two guest staterooms are paneled with hand-rubbed teak.The VIP stateroom is aft of the foyer to starboard. 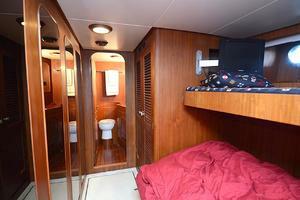 This stateroom features a queen berth, night table, storage, a hanging locker, and an ensuite head/shower.Across the way is a study/media room which can be converted into a fourth guest cabin. In this entertainment area, you will find a Plasma TV with a DVD player and a U-shaped settee.Back up to the helm, there is a unique double bench seat that is able to slide forward at the helmsman's leisure. 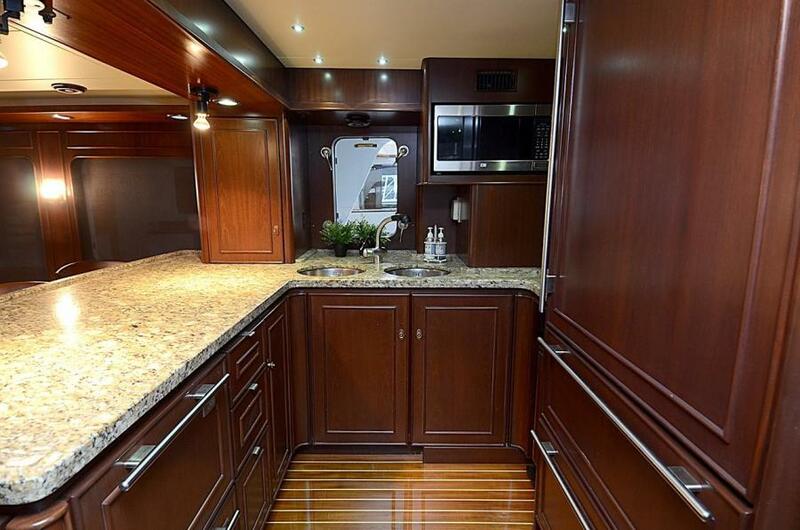 There are cabinets on either side of the helm for extra storage space. Starboard of the helm controls is a chart table with a seat and storage for a collection of charts. 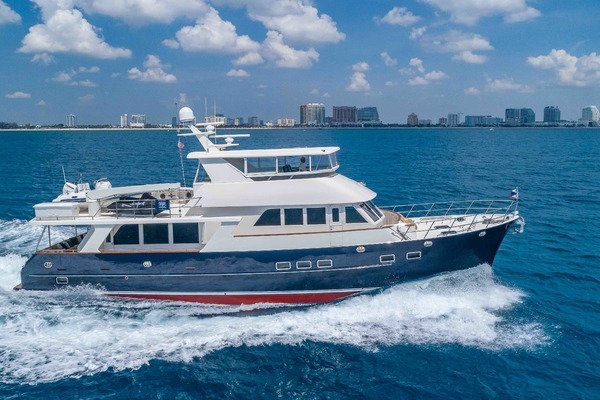 The communication center is located about-face of the chart table on the bulkhead.The flybridge can be accessed from the port-side ladder in the pilothouse. The flybridge is a generously spacious area where you can enjoy sunbathing, fresh air, and spectacular views of all in which you are surrounded by. Over the helm is a bimini with a double-arch mast. 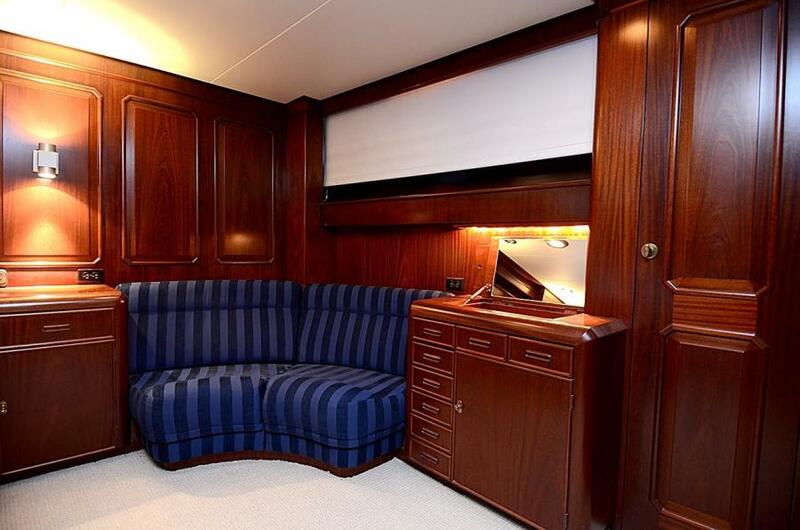 Lounging is provided to port and starboard of the helm, with storage areas below.To the port aft end of the flybridge you can descend down to the aft deck where you will notice a large settee and table - a luxurious ambiance to relax or enjoy outdoor dining.To port of the aft deck, there is a curved staircase leading down to the cockpit area. Facing forward, there is a hatch that, if opened, reveals the captain's cabin. In the cabin is a queen-size berth and an ensuite head/shower.The foredeck can be accessed via sidedecks on the port and starboard sides. 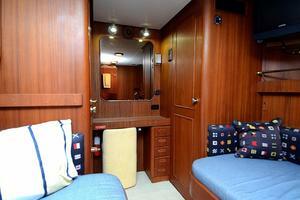 Extra storage is provided, along with two lounge seats. 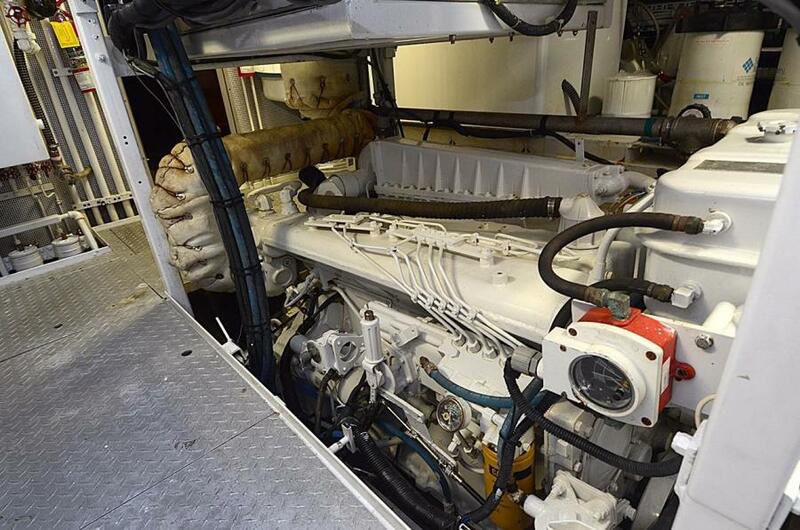 In 2004, new twin 250 HP 3306 BTA Caterpillar main engines were installed (617hrs 5/16). 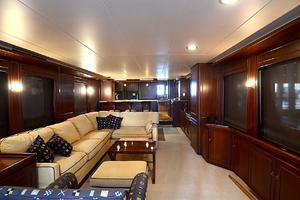 You can access the engine room from the master stateroom's companionway or through a door from the side deck. 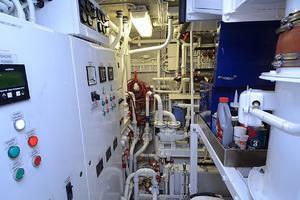 This is large, walk-in engine room has a walkway in the center and has a stainless steel work bench.There are five (5) fuel tanks - including a day tank that has auto fill - with a manifold system, plus a250 litre clean lube oil tank and 250 litre dirty oil lube tank with an oil change system and pump. This system makes it easy to transfer fuel each tank or to the day tank. The bilge pump system installed is able to service five (5) locations aboard the boat which are alarmed automatically if there is any water intrusion. There are two additional systems that back this system. 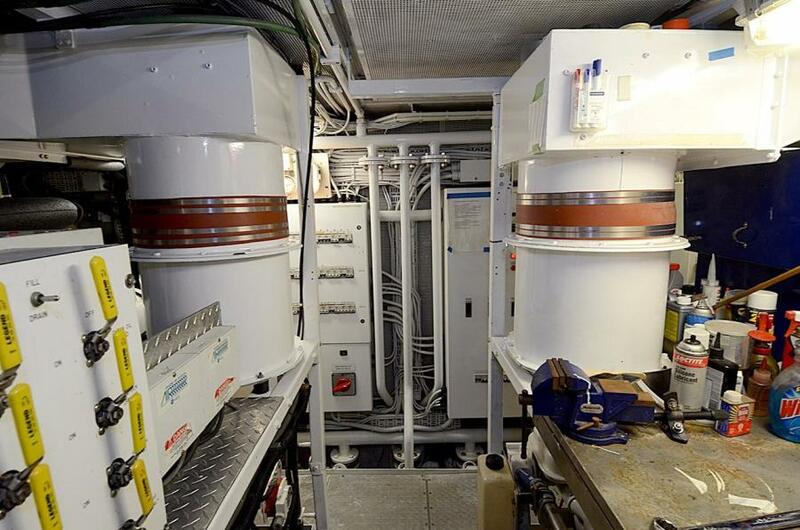 Also, there is a separate pumping system for the two gray water tanks. 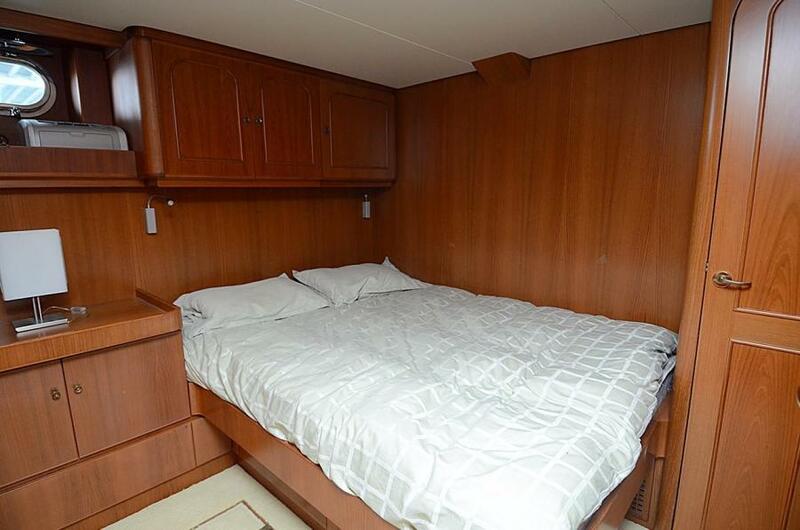 Hull: 8mm welded steel keel plating, 6mm and 8mm welded steel bottom plating and 5mmtopsides plating. 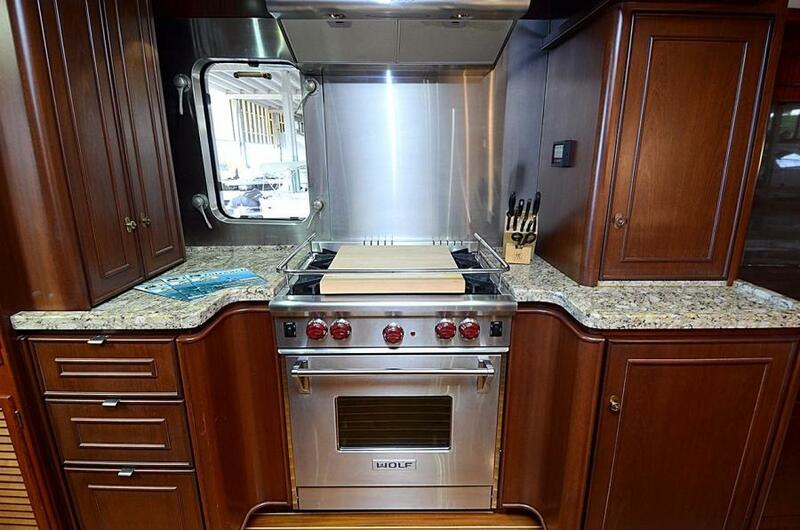 Hull framing includes 180mm by 80 mm by 8mm bottom longitudinals,75mm by 8mm topsides longitudinals, and 75mmby 8mm traverse framing on 400mm centers with 8mm stringers welded to the frames. Integral tanks within the vessel’s hull envelope provide additional hull structure. 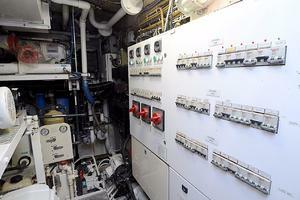 Fuel: 3000 gallons in five separate tanks with electric and manual backup transfersystem. An additional 1000 gallon tank is plumbed. 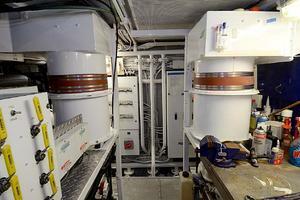 It is presently decommissioned &being used for storage.